How to Download/Install Play Store 4.0.25! Google has announced earlier today that the new Play Store 4.0, specifically 4.0.25, is being pushed out to all Android devices starting today. That may take couple hours or even few weeks depending on the Android device you have but if you don’t want to wait, simply go ahead and download the APK file below and install on any Android device, no root required! What’s new with the new Play Store 4.0? The whole UI has been revamped with blend of white, grey, and green, I kinda like the new look, it’s cleaner and a lot easier to browse. For apps, you will find more categories including new sections like Play Picks and also “Recommended for You” section for almost every category of apps. Also, for Movies & TV, it’s much better organized on the new Play Store 4.0.25 with New Movie Releases followed by categories recommended based on your movie purchases. Overall, the new design on the Play Store 4.0 looks much simpler and easier to navigate than before. Go ahead, try it for yourself today and do let us know any cool easter eggs you find, I bet there are some since it’s still April. Having trouble with the new Play Store 4.0? Says cant open file on ATT s3 with synergy rom? Says cannot open file. Ohwell…thanks man. Are you using a file explorer? Try ES File Explorer. wow, that interface looks like I would expect an old beta version to look. really don’t like it. but it does the job I guess. Works for me on ATT S3 and S2. Will it be an over the air update. Or do I have to download it. 4.0.25 is working perfectly fine for me. On Tmo Note II. Is anyone else unable to load downloadandroidrom,com? Is anyone able to post another link? same here, is your download site down max? My host was down temporarily like 11 hours ago but should be up now. Thanks Max! This is great. Next story Overlays App for Android – Run Any Widgets Over Apps! 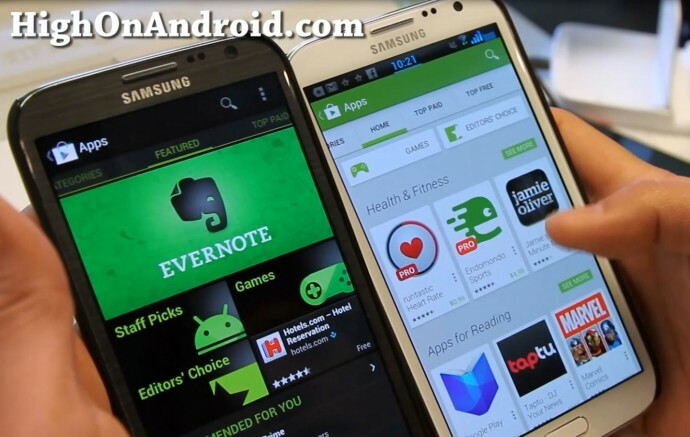 Previous story Galaxy S4 S Translator Demo and How to Install On Rooted Galaxy S3/Galaxy Note 2!